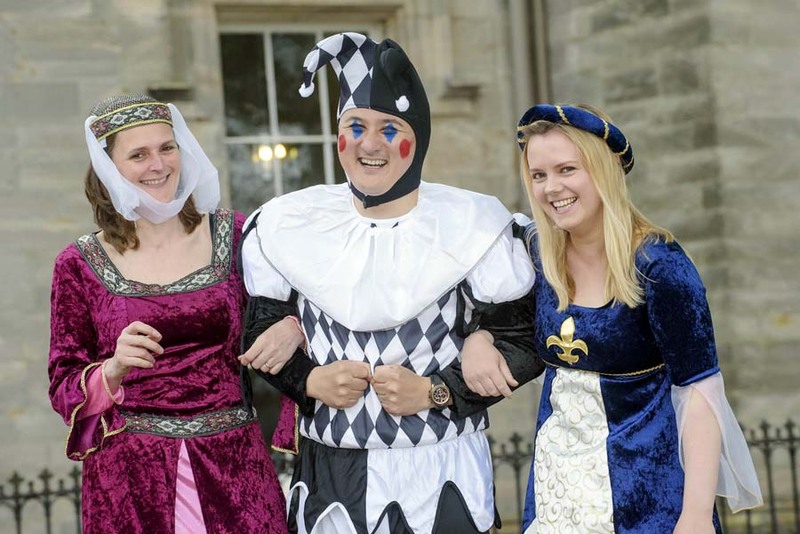 Winton Castle, the business events and wedding venue in East Lothian, held a party last night to celebrate more than 500 years of history and changing back to being called ‘Winton Castle’. It only adopted the more modest name of Winton House in the 1960s, and ‘once a castle, always a castle’. The intricate plaster ceilings and carved twisted chimneys now shine out to welcome visitors to exclusive business events, private parties and weddings. Around 100 visitors from the hospitality industry and business world attended the celebration and were entertained sixteenth century style by fire-jugglers, axe throwers, medieval musicians, men-at-arms and clan drummers. 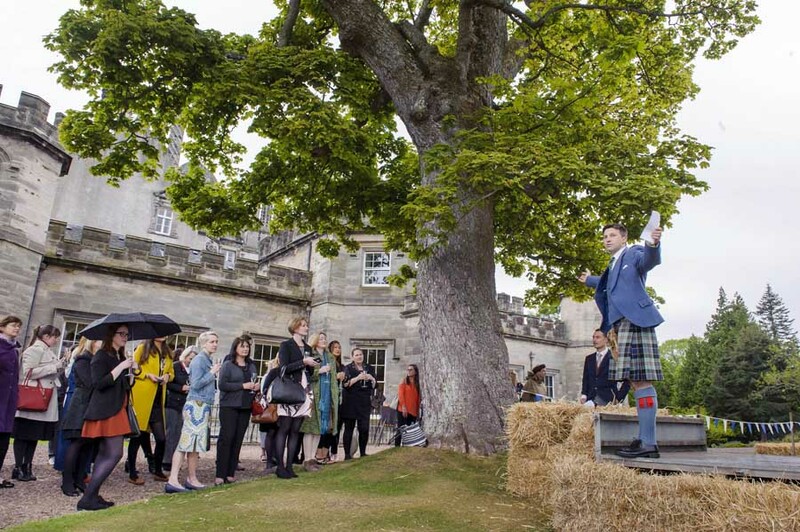 Guests were welcomed by Sir Francis Ogilvy, owner of Winton Castle, as they sipped castle cocktails and enjoyed canapés concocted from venison, scallops, quail, beetroot and asparagus from award-winning caterers, Appetite Direct. A sumptuous modern day feast followed. “As far as our food is concerned, Winton is a ‘modern castle’ where we like to serve contemporary, top class dishes from local, seasonal ingredients. Our food also draws on Winton Castle and the Estate’s rich heritage,” says James Maynard, Winton’s General Manager. “Gareth Harrison, our head chef, and his team designed a feast fit for a castle for the Winton party,” adds Nigel Kennedy, MD at Appetite Direct. “We were inspired by the traditional castle kitchen and garden as our theme for the menus. These featured local, seasonal produce and game, echoing the diet of Winton inhabitants over the centuries. “Our dishes used organic foods from around Scotland: Scallops from Shetland, Scottish pork, local venison and organic vegetables from East Lothian. The desserts were classic flavours from the Victorian era with modern twists. In the dining room there was a gastronomic display which included two whole roast suckling pigs with modern garnish, smoked ham hough and parsley croquettes with crispy pigs ears, and puffed pork skin. Guests were also entertained with an interactive canapé demonstration in the Cabinet Room. 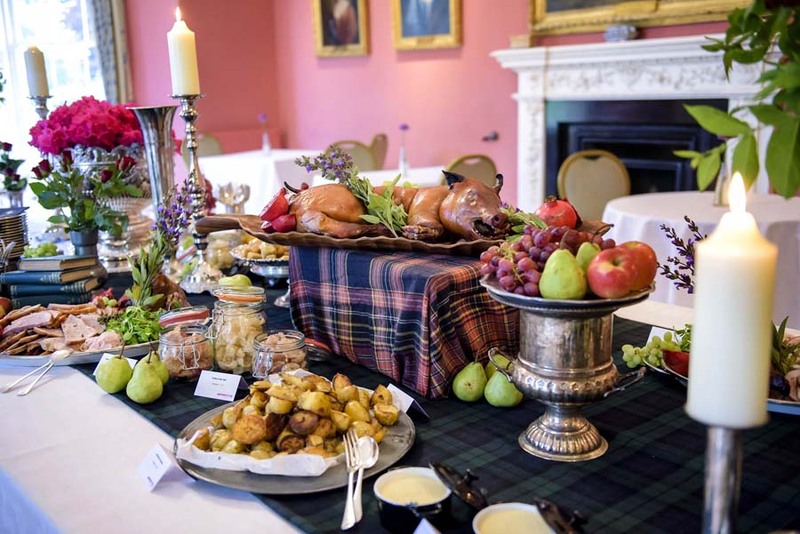 Appetite Direct from Edinburgh have catered for more than 100 events at Winton Castle over the last 10 years: many weddings, as well as birthdays, anniversaries and corporate events. Winton is one of their original clients and a long-standing partner. For further information contact Christopher Lamotte on 07957 87071 or by email.